I love cooking with cauliflower, especially in this time of year when it’s so plentiful. But sometimes I can find myself in a rut. I love buttered mashed cauliflower and creamy cauliflower soup as much as the next girl, but recently I got the impression that my loved ones may have been getting bored with my preparation methods. I think it was something about the way The Ukrainian said, ‘We should do something new with cauliflower, not just the same things over and over.’ Oops. Anyway, he was right: sometimes you gotta switch things up every once in a while. Variety is the spice of life, right? This salad is quite common here in Ukraine, kind of like potato or egg salad for Americans, and it’s sold at every supermarket deli counter. It was there at the supermarket that The Ukrainian pointed it out to me and suggested we try to make it ourselves. Now that I’ve tried it, I’m definitely going to add it into my cauliflower recipe arsenal! It’s usually made with sugar to balance out the tanginess of the vinegar. (Ukrainians don’t like tangy flavors, I’ve found.) If you prefer a more sweet-sour taste, add a tablespoon of the best honey you can find: raw and organic is preferable. If you like the tangy flavor, you can omit the honey. 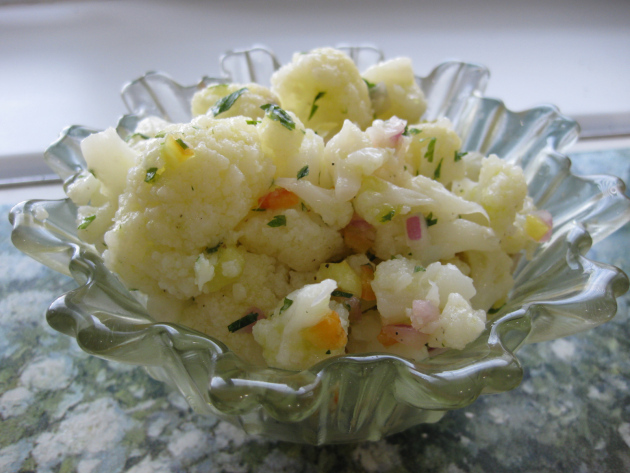 A common Ukrainian salad to liven up cauliflower. This recipe is paleo and vegan and can be made raw if desired. Cut the cauliflower into bite-sized pieces. 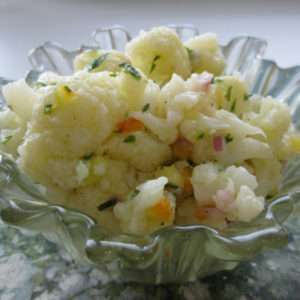 While the cauliflower comes to room temperature, mix remaining ingredients together in a small bowl. When the cauliflower is ready, drain it and then pour the marinade mixture over the top and stir it thoroughly. Let it chill in the fridge for at least 4 hours, preferably overnight. To make it raw, skip the cooking steps, cut the cauliflower smaller, and let the salad marinate longer to soften the cauliflower. Seriously just blew my mind, this sounds tasty but the idea that I can use cauliflower as a replacement in many potato salads… gives me hope!